The Roll Back Malaria MiP Working Group produced a two-page infographic to raise awareness and advocate for increased resources to prevent MiP. MiP is a significant public health issue with harmful consequences for not only pregnant women, but also for unborn and newborn children.1 Every year, MiP is responsible for the death of over 100,000 newborns and 10,000 pregnant women around the world.2 MiP is also associated with anemia, spontaneous abortion, stillbirth, prematurity, low birth weight and severe malaria. Young women in their first and second pregnancies and those who are infected with HIV are at highest risk.3 MiP-associated illnesses are most prevalent in sub-Saharan Africa. This advocacy guide is designed to help countries put an advocacy plan in place to scale up MiP interventions nationwide. It includes an MiP scorecard to measure achievements over time. World Health Organization. Malaria in Pregnant Women. World Health Organization website. http://www.who.int/malaria/areas/high_risk_groups/pregnancy/en/. Accessed September 13, 2016. Roll Back Malaria, Malaria in Pregnancy Working Group. http://www.rollbackmalaria.org/files/files/working-groups/MiPWG/RBMMiPWG%20Infographic%2023May2016.pdf. Accessed October 25, 2016. Center for Disease Control and Prevention. Intermittent Preventive Treatment of Malaria for Pregnant Women (IPTp). Center for Disease Control and Prevention website: http://www.cdc.gov/malaria/malaria_worldwide/reduction/iptp.html. Accessed July 18, 2016. World Health Organization. WHO policy brief for the implementation of intermittent preventive treatment of malaria in pregnancy using sulfadoxine-pyrimethamine (IPTp-SP). 2014. World Health Organization. Eliminating Malaria. 2016. Hill et al. The contribution of malaria control to maternal and newborn health. Roll Back Malaria Progress and Impact Series No. 10. 2014. Roll Back Malaria Partnership. 2015 Global Call to Action. 2015. World Health Organization. World Malaria Report 2015. 2015. Ricotta E, Koenker H, Kilian A, et al. Are pregnant women prioritized for bed nets? An assessment using survey data from 10 Africa countries. Glob Health Sci Pract. May 1, 2014; vol. 2 no. 2 p. 165-172. http://www.ghspjournal.org/content/2/2/165. Accessed September 13, 2016. UNICEF. Antenatal Care Coverage. http://www.data.unicef.org/maternal-health/antenatal-care.html. 2016. Hill J, Hoyt J, van Eijk AM, et al. Factors affecting the delivery, access, and use of interventions to prevent malaria in pregnancy in sub-Saharan Africa: a systematic review and meta-analysis. PLoS Med. 2013. 10(7), e1001488. Why was this iKit created? The Health Communication Capacity Collaborative's review of MiP SBCC strategies describes the structure and content of 5 country strategies and provides recommendations for improving MiP content. Moreover, many SBCC activities are not strategically developed, and miss opportunities to improve their reach and impact. A 2014 PMI review of MiP content in malaria communication strategies from five sub-Saharan African countries found a lack of documented formative research to inform priorities, as well as weak audience segmentation, unclear roles and responsibilities between national malaria control programs (NMCPs) and reproductive health programs, and inconsistencies between national malaria strategic plans and their supporting malaria communication strategies.2 This review found few examples of SBCC targeting service providers in national malaria communication strategies. With these gaps in mind, this reference guide was developed to help SBCC and MIP program managers and stakeholders address some of these gaps and improve SBCC strategies and interventions for MIP, especially those interventions that target healthcare workers. Health Communication Capacity Collaborative. Interventions Targeting Health Workers to Improve Provision of Malaria in Pregnancy Services and Commodities: an SBCC Perspective. 2015. Health Communication Capacity Collaborative. Social and behaviour change communication in support of malaria in pregnancy control prevention. 2014. The Maternal and Child Health Integrated Program's Review of MiP issues highlights the need for better integration between national malaria control programs and reproductive health programs. MiP is a crosscutting issue that involves a variety of partners – from NMCP and reproductive maternal and child health units, ministry of health (MOH) technical working group members and leadership from health promotion and community services units. PMI teams and NMCP units are also likely to work in collaboration with reproductive, maternal, newborn and child (RMNCH) health specialists that are not focused exclusively on malaria. As readers go through this document, they should think of ways to collaborate with these stakeholders – public and private sector, those working at the national-level or policy level and those working at the regional-level, district-level or community level. Readers may find it useful to convene a stakeholder workshop when designing or updating a malaria communication strategy to encourage feedback and input from various perspectives and ensure buy-in from all relevant MOH units and implementing partners. It is often best to include these various partners in the creative strategy development process to identify blind spots and reduce inefficiencies. Readers should review the data sources, case studies and considerations included in these sections to ensure that their situation analysis identifies the evidence-based approaches and lessons learned. This information will strengthen the MiP section of your malaria SBCC strategy. Considerations listed in the service provider and community sections are meant to help determine which factors are most influential. While some patterns exist across countries or regions, examples listed are intended to be ideas for inquiry, not representative truth. This section gives a brief list of national and subnational data to review to gain a deeper understanding of the context in which one is working. The RBM, WHO and PMI have produced a number of global guidance documents and consensus statements that should be considered when conducting a situation analysis. Some of these resources are listed below. 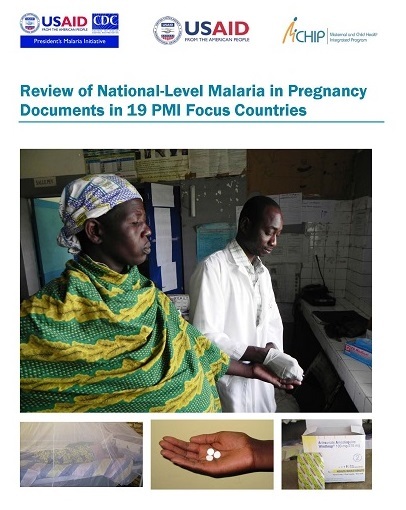 Optimizing the Delivery of Malaria in Pregnancy Interventions (PMI, 2013): This consensus statement should be reviewed to ensure MiP priorities, interventions, monitoring and evaluation, and research are evidence-based and in line with priorities agreed on by global MiP stakeholders. WHO policy brief for the implementation of intermittent preventive treatment of malaria in pregnancy using sulfadoxine-pyrimethamine (WHO, 2014): This policy brief contains the latest IPTp guidelines clarifying the method and timing of sulfadoxine-pyrimethamine (SP) delivery. Use this brief to ensure IPTp guidance is accurate and up to date. Intermittent Screening and Treatment in Pregnancy and the Safety of ACTs in the First Trimester (WHO, 2015): This reference document provides recommendations on Intermittent Screening and Treatment in pregnancy (ISTp) and use of ACT in the first trimester. Consult this resource to understand why global stakeholders discourage ISTp as an alternative to IPTp-SP. Consensus Statement on Folic Acid Supplementation during Pregnancy (RBM Partnership’s Malaria in Pregnancy Working Group, 2015): Refer to this consensus statement to ensure that folic acid is procured in doses that will not interfere with the SP. It also answers a number of frequently asked questions. Some articles have indicated that health worker age and experience may determine the quality of services or adherence to national guidelines.1,2 This varies among studies. Some studies found that more years of working experiences (three or more) were associated with better service provider adherence to malaria testing and treatment guidelines. Others reported that younger health workers adhered more closely to guidelines than older health workers.3,4 What motivates or influences health facility based providers may be very different from community-based health workers. Where and when this proves to be true, malaria communication strategies should include SBCC interventions targeting service providers and/or community health workers (CHWs), taking care to tailor these efforts to each group by segmenting them by age and/or experience. These findings suggest that attitudes of different cadres of health worker often vary. If the situation analysis reveals variances in attitudes and behaviors between different levels of health worker, it may be necessary to design separate and tailored content for trainings and/or supportive supervision to providers, based on the divisions identified in the analysis. Variances in attitudes, beliefs, and behaviors between different levels of health worker can be measured using Likert scales (asking a respondent to rate their agreement with a statement on a scale that ranges from approval to disapproval). These scales might be included on surveys administered during in-service training or asked during supportive supervision visits. Kambarami RA, Mbuya MN, Pelletier D, et al. Factors Associated With Community Health Worker Performance Differ by Task in a Multi-Tasked Setting in Rural Zimbabwe. Glob Health Sci Pract. 2016;4(2):238-50. Jaskiewicz W, Tulenko K. Increasing community health worker productivity and effectiveness: a review of the influence of the work environment. Hum Resour Health. 2012;10:38. Kok MC, Dieleman M, Taegtmeyer M, et al. Which intervention design factors influence performance of community health workers in low- and middle-income countries? A systematic review. Health Policy Plan. 2015;30(9):1207-27. Selemani M, Masanja IM, Kajungu D, et al. Health worker factors associated with prescribing of artemisinin combination therapy for uncomplicated malaria in rural Tanzania. Malar J. 2013;12(1):334. Zurovac D, Njogu J, Akhwale W, Hamer DH, Snow RW. Translation of artemether-lumefantrine treatment policy into pediatric clinical practice: an early experience from Kenya. Trop Med Int Health. 2008;13(1):99–107. Steinhardt LC, Onikpo F, Kouamé J, et al. Predictors of health worker performance after Integrated Management of Childhood Illness training in Benin: a cohort study. BMC Health Serv Res. 2015;15:276. Kwarteng A, Asante KP, Abokyi L, et al. Provider compliance to artemisinin-based combination therapy at primary health care facilities in the middle belt of Ghana. Malar J. 2015;14(1):361. A number of studies show that the attitudes of health providers – not only their level of knowledge or training – can affect the type and level of care they provide. A study in Tanzania found IPTp delivery among service providers was attributed to mistrust of the medicine. Providers did not understand the reasoning for continued use of SP for IPTp when the drug had been discontinued for first-line treatment.1 A systematic review and meta-analysis of factors affecting delivery, access and use of interventions to prevent MiP in sub-Saharan Africa also found poor knowledge and perceptions among service providers regarding IPTp using SP. In many instances, service providers blamed pregnant women’s behavior for poor IPTp uptake2,3 or treated them in an unprofessional manner.4 Furthermore, the type of information communicated to pregnant women about IPTp varied widely across studies. These studies demonstrate that provider knowledge is not the only determinant of whether a woman will receive the proper dose and counseling for IPTp. As provider attitudes often play a substantial role in determining the provision of IPTp, inquiry into provider knowledge and awareness of national guidelines may be insufficient. Likewise providing written guidelines as a sole means of initiating change may be ineffective. SBCC is often used to encourage the adoption of new behaviors. In health facilities, where in-service training and supportive supervision exist, access to information like MiP policy and guidelines is likely higher. When an individual or group is already aware of a desired practice, use of theories and approaches that emphasize behavior maintenance may be effective. The decision criteria that leads people to initiate a behavior is markedly different than those that drive them to maintain that behavior.5,6 Theories like Stages of Change and Diffusion of Innovation predict challenges or challenging environments and provide structured ways to determine how to prepare individuals or groups for sustained change. For example, the Stages of Change model assesses whether an individual or group falls into one of several categories along a continuum of not behaving, to adopting a behavior, to continuing to behave in a certain way. These stages are pre-contemplation, contemplation, preparation, action, and maintenance. Different interventions are designed to address the specific concerns of each audience, depending where they are on the continuum. The model is not linear, meaning that it is not assumed that people only advance through these stages. It assumes that many people will try a new behavior (action), fail, and then require more motivation or encouragement (preparation) before they try again and eventually move into the maintenance stage. The case study below, designed using the Stages of Change model, shows how planning for challenges in maintaining a new behavior may improve attempts that might otherwise fall short. A cluster-randomized trial of an intervention designed to improve service provider adherence to malaria prescription and counseling practices took place in Kenya. The project team sent SMS messages with information and motivating quotes to providers on a regular basis, which resulted in improved case management practices. This study was intentionally designed to operate at the action and maintenance stages of behavior change by creating an enabling environment and then using cues to action. Anders K, Marchant T, Chambo P, Mapunda P, Reyburn H. Timing of intermittent preventive treatment for malaria during pregnancy and the implications of current policy on early uptake in north-east Tanzania. Malar J. 2008;7:79. Hill J, D’mello-Guyett L, Hoyt J, van Eijk AM, ter Kuile FO, Webster J. Women’s access and provider practices for the case management of malaria during pregnancy: a systematic review and meta-analysis. PLoS Med. 2014;11(8):e1001688. Onyeneho NG, Idemili-aronu N, Igwe I, Iremeka FU. Perception and attitudes towards preventives of malaria infection during pregnancy in Enugu State, Nigeria. J Health Popul Nutr. 2015;33:22. Marlatt GA, Donovan DM. Relapse Prevention, Maintenance Strategies in the Treatment of Addictive Behaviors. Guilford Press; 2007. Rothman AJ. Toward a theory-based analysis of behavioral maintenance. Health Psychol. 2000;19(1 Suppl):64-9. Jones CO, Wasunna B, Sudoi R, Githinji S, Snow RW, Zurovac D. "Even if you know everything you can forget": health worker perceptions of mobile phone text-messaging to improve malaria case-management in Kenya. PLoS ONE. 2012;7(6):e38636. Just as clients have some social influence on their providers, providers themselves influence one another. Measuring individual behavior change may prove less effective than assessing the work culture in different health facilities (as in the example below). Research shows that pregnant women’s preference for ACT drugs in first trimester, as well as perceptions of drug safety and risk of malaria during pregnancy, have influenced MiP-related behaviors in multiple countries.1,2 In Cameroon and Cambodia, women’s drug preference and perceived affordability were found to influence service provider prescription practices.3,4 The evidence base for how preferences and perceptions affect service providers’ prescription practices at the global level is limited. Reports that pregnant women are unaware of the risks of MiP and/or mistrust the safety of SP are neither widespread nor consistent; however, issues of social influence do exist and should be considered. When conducting a situation analysis, measuring social norms and influences can be just as important as an individual’s knowledge and behavior. Measuring social norms and or the influence different groups of people may have on service providers could be done with in-depth interviews, focus groups, or doer-non-doer analysis. In a doer non-doer analysis, key barriers to behavior are identified by using either focus groups or individual surveys. In both scenarios questions are asked separately of those that engage in a behavior, and those who do not, and then compared. This analysis often identifies primary target groups, what actions should be taken to change a behavior, psycho-social or structural barriers most likely to influence action, and what strategies are most likely to address identified barriers. The Innovations at Scale for Community Access and Lasting Effects (inSCALE) project conducted two interventions to improve health worker motivation and sustained performance. In-depth interviews and focus group discussions conducted in both Uganda and Mozambique indicated that community health workers responded to the influence of group identification. Community health workers surveyed valued feedback and feeling connected to both their health system and the communities they serve. Designers of the inSCALE project set out to determine if being a member of a well-defined group (in this example, a community health volunteer) motivates or drives a member to perform well in order to attain social identity within the group. If actions that promote the positive social identity of a group are clear and understood by all members, it is possible that members will be motivated to work for the betterment of the group. In Uganda and Mozambique, interventions were designed to create a sense of shared experience, focusing on the alignment between workers and program goals. A participatory, local community approach using village health clubs (in Uganda) and an information communication technology approach using mobile phones (in Mozambique) were designed to appeal to community health workers’ goals and desire for status and feelings of connectedness. Currently undergoing evaluation (part of a randomized control trial), the inSCALE approach represents a new and promising approach to improving health worker motivation and performance. Hill J, D’mello-Guyett L, Hoyt J, van Eijk AM, Kuile FO, Webster J. Women’s access and provider practices for the case management of malaria during pregnancy: a systematic review and meta-analysis. PLoS Med. 2014;11(8):e1001688. O’Connell KA, Samandari G, Phok S, et al. “Souls of the ancestor that knock us out” and other tales. A qualitative study to identify demand-side factors influencing malaria case management in Cambodia. Malar J. 2012;11(1):335. Irimu GW, Greene A, Gathara D, et al. Factors influencing performance of health workers in the management of seriously sick children at a Kenyan tertiary hospital--participatory action research. BMC Health Serv Res. 2014;14:59. Namazzi G, Waiswa P, Nakakeeto M, et al. Strengthening health facilities for maternal and newborn care: experiences from rural eastern Uganda. Glob Health Action. 2015;8:24271. Strachan DL, Källander K, Nakirunda M, et al. Using theory and formative research to design interventions to improve community health worker motivation, retention and performance in Mozambique and Uganda. Hum Resour Health. 2015;13:25. Gather information during ISTs and supportive supervision to help decide which channel of communication is most likely to change service provider behavior. While there is not enough evidence to support recommending any one IST, supportive supervision or information technology approach in an MiP context, broader research shows that multichannel efforts to change service provider behavior may be more effective than standalone efforts.3,4 Programs that disseminate simple written guidelines are generally ineffective. Rowe AK, Rowe SY, Peters DH, Holloway KA, Chalker J, Ross-Degnan D. The Health Care Provider Performance Review: a systematic review of the effectiveness of strategies to improve health care provider performance in low- and middle-income countries. Presentation of preliminary results; March 23, 2015; Washington, DC. Cundill B, Mbakilwa H, Chandler CI, et al. Prescriber and patient-oriented behavioural interventions to improve use of malaria rapid diagnostic tests in Tanzania: facility-based cluster randomised trial. BMC Med. 2015;13:118. Rowe AK, De Savigny D, Lanata CF, Victora CG. How can we achieve and maintain high-quality performance of health workers in low-resource settings? Lancet. 2005;366(9490):1026–1035. Masanja IM, Selemani M, Khatib RA, et al. Correct dosing of artemether-lumefantrine for management of uncomplicated malaria in rural Tanzania: do facility and patient characteristics matter? Malar J. 2013;12(1):446. Das A, Friedman J, Kandpal E, et al. Strengthening malaria service delivery through supportive supervision and community mobilization in an endemic Indian setting: an evaluation of nested delivery models. Malar J. 2014;13(1):482. Nair N, Tripathy P, Costello A, Prost A. Mobilizing women's groups for improved maternal and newborn health: evidence for impact, and challenges for sustainability and scale up. Int J Gynaecol Obstet. 2012;119 Suppl 1:S22-5. Goodman CA, Mutemi WM, Baya EK, Willetts A, Marsh V. The cost-effectiveness of improving malaria home management: shopkeeper training in rural Kenya. Health Policy Plan. 2006;21(4):275-88. There are a number of community-level factors that have been shown to influence the use of MiP interventions. As with the service provider considerations, primary or secondary research should be used to determine which factors a a communication strategy will need to address. Some of these may include awareness, social support, response-efficacy, self-efficacy, attitudes and perceived risk. Read more about a new line of inquiry, Gateway Behaviors, below. Many pregnant women are not aware that malaria parasites can survive in the placenta without causing symptoms. Pregnant women in many contexts have been found to be unaware that IPTp exists or that it prevents malaria during pregnancy.1,2 In order to determine whether or not pregnant women are aware of IPTp and its benefits, rely on Malaria Indicator Survey questionnaires or other household surveys. As mentioned earlier, it is important to decide whether to promote ANC or ask that pregnant women be responsible for asking about and recalling the various medications they will receive there. In 2016, African Leaders Malaria Alliance (ALMA) representatives visited Liberia to decide on a number indicators to track on the country’s new scorecard*. The Liberian NMCP was the first country that elected to track a malaria SBCC indicator. The indicator chosen was the percentage of respondents with accurate knowledge of malaria transmission and prevention. Accurate knowledge of malaria transmission is defined as having answered only “mosquitoes cause malaria” (listing no other causes). Accurate knowledge of malaria transmission (among pregnant women) was defined as stating that “sleeping under an LLIN or early and regular ANC attendance prevent malaria” (listing no other methods). This information is collected in MIS surveys, and can be calculated historically to identify trends. Wanzira H, Katamba H, Okullo AE, Rubahika D. The challenge of using intermittent preventive therapy with sulfadoxine/pyrimethamine among pregnant women in Uganda. Malar J. 2016;15(1):401. Conduct formative research or a rapid assessment to determine barriers and facilitators to ANC attendance or use of health care facilities. Consider identifying care-seeking decision makers and ensure they are the focus of SBCC efforts that will create an enabling environment for pregnant women willing to attend ANC. Ribera JM, Hausmann-muela S, D'alessandro U, Grietens KP. Malaria in pregnancy: what can the social sciences contribute?. PLoS Med. 2007;4(4):e92. Finlayson K, Downe S. Why do women not use antenatal services in low- and middle-income countries? A meta-synthesis of qualitative studies. PLoS Med. 2013;10(1):e1001373. Demand for commodities like LLINs and SP may depend on a woman’s trust that they are an effective means of protecting her and her unborn child. Studies in Kenya and Mali have documented low awareness of the benefits of IPTp during pregnancy.1 It is important to not only raise awareness that MiP is dangerous, but convince pregnant women and their families that the benefits of attending ANC and receiving IPTp outweigh challenges. The perception that a behavior will control the threat of sickness is powerful. A situation analysis might include exploration into whether or pregnant women or those who influence them are aware of the benefits of ANC. Belief that a behavior or commodity will protect against malaria may lead to higher adoption of new behaviors (like early and regular ANC attendance). Consider using concrete examples of a behavior’s benefit to convince target populations to adopt it. The Champion Communities approach was used in Zambia to demonstrate the effectiveness of prompt care seeking and ITN use. This participatory approach combines interpersonal communication with data collection. Communities in Zambia set their own goals and conducted monthly surveys to determine progress. Evaluation of this approach reported higher rates of prompt care seeking and net use in communities that saw concrete benefits related to these behaviors. Christina Wakefield, the project’s director, attributes the initiative’s success to the communities’ reaction to dramatic decreases in malaria sickness following widespread adoption of these behaviors. Hill J, Kayentao K, Achieng F, et al. Access and use of interventions to prevent and treat malaria among pregnant women in Kenya and Mali: a qualitative study. PLoS ONE. 2015;10(3):e0119848. Communications Support for Health (CSH) Programme. Zambia communications support for health: stop malaria champion communities programme evaluation. USAID. 2014. The personal conviction or belief that performing a specific action is possible, and within one’s power, is an important driver of behavior.1Pregnant women must be convinced that a habitual action, like sleeping under an LLIN every night or attending ANC once a month, is realistic. Learning more about a target populations’ self-efficacy to perform various MiP prevention and control behaviors will help inform the focus of a communication strategy. Indicator 10 (below) measures self-efficacy. If survey respondents report low levels of self-efficacy, SBCC interventions encouraging this behavior that do not first improve a pregnant women’s environment (service provider treatment, availability of SP at ANC, spousal support, family support and social norms) are unlikely to be successful. To improve a pregnant woman’s support to attend ANC, consider encouraging spousal participation and/or approval at ANC (as in the example below). In Tanzania, the Safe Motherhood campaign was originally designed as a MiP initiative but eventually expanded to include a broader range of safe motherhood behaviors. Formative research indicated that women in Tanzania were arriving at ANC late and not frequently enough. A culture of secrecy surrounding pregnancy, and distance from health facilities, were the other key behavioral determinants discovered. To address this, the second phase of the campaign demonstrated ways couples could “show their love,” modeling both partners traveling to and attending ANC. This 1-minute TV spot is part of the multi-channel Wazazi Nipendeni (Love me, Parents) campaign which aims to integrate all safe motherhood health areas under one platform, including early and complete ANC attendance, malaria prevention, the prevention of mother to child transmission of HIV (PMTCT), individual birth planning and safe delivery. In the original version of the spot, the couple was shown happily interacting with their children, and the husband helping around the house, followed by a flashback to the pregnancy time period. The pretest audience felt this was too confusing, so the spot was redone to take place in the present only. The final version of the spot shows a couple struggling to get to the clinic, but finally arriving there, emphasizing the importance of doing whatever it takes. Women who spoke with their spouse about family health issues between baseline and end line were more likely to report a greater number of subsequent health behaviors compared with women who had not communicated with their spouse. Women who reported attending four or more ANC visits during their last pregnancy were more likely to report a greater number of subsequent health behaviors than those who attended fewer visits. The importance of encouraging discussion between partners about family health issues has significant implications for families and service providers. Encouraging a couple to attend ANC visits together enables potential productive future-focused discussions. Service providers who encounter couples at ANC should be enabled to provide counseling about what to expect and plan for before, during, and after pregnancy. As the study states, “Antenatal care in particular is an opportunity to engage women (and couples) in thinking about the issues they should anticipate and plan for while preparing for delivery, during the immediate postpartum period and later, during the first years of an infant’s life and as their family grows.” Two interventions used to initiate these behaviors in this study were practicing the Greet, Ask, Tell, Help, Explain and Return (GATHER) approach in ANC service delivery by providers, and providing tips to initiating discussions on family health between couples. While MiP was not specifically measured, these findings highlight the importance of improving not only the accessibility of ANC services, but the quality and content of service provider interpersonal communication with clients. It also highlights the importance of encouraging spousal communication about family health issues to improve not only MiP but also a range of maternal and child health behaviors. Bandura, A. (1986). Social foundations of thought and action: A social cognitive theory. Prentice-Hall, Inc.
Wazazi Nipendeni- Love Me, Parents. Health COMpass spotlight. http://www.thehealthcompass.org/sbcc-spotlights/wazazi-nipendeni-love-me-parents. Accessed September 13, 2016. Schwandt H, Skinner J, Takruri A, Storey JD. 2015. The Integrated Gateway Model: A catalytic approach to behavior change. International Journal of Gynecology & Obstetrics. 2015;05.003. http://dx.doi.org/10.1016/j.ijgo. There are many instances of service providers failing to foster a welcoming atmosphere during ANC. Assuring women that they will be treated with respect may increase the likelihood they will attend ANC early and regularly thereafter. Poverty, inequality and livelihood insecurity can jointly and independently determine access to health care.1,2,3 Pregnant women weigh any number of fears unrelated to disease when making the decision to go to an ANC visit. For example, while some women have expressed mistrust in the safety of SP during pregnancy4 there are also numerous studies documenting a lack of patient counseling, leading to low awareness of what kind of medicines are taken (and what they are taken for) during ANC. While requiring providers to explain the benefits and reasons for each medicine prescribed at ANC is important, asking pregnant women to recall the names and benefits of many medicines may not prove realistic. The simplicity’s sake, it may be sufficient to encourage pregnant women to attend ANC. The framing of this message, however, can crafted to include overall health, not because of a single disease. Justification for framing the importance of attending ANC in the context of overall health, and not as a single disease is described in the Malawi ethnographic study example below. Paying attention to disease-specific behaviors among a target population, or “at-risk” group is common. The Malawi study demonstrates how, in some contexts, this focus on a single disease, instead of inquiring about general pregnancy concerns, may have been too narrow. Focus group discussions, in-depth interviews, and /or ethnographic studies are ways to determine whether malaria is thought of as separate from causes of illness, and whether designing campaigns directed at overall healthy pregnancies may resonate more. Farmer PE, Nizeye B, Stulac S, Keshavjee S. Structural violence and clinical medicine. PLoS Med. 2006;3(10):e449. Obrist B, Iteba N, Lengeler C, et al. Access to health care in contexts of livelihood insecurity: a framework for analysis and action. PLoS Med. 2007;4(10):1584-8. Sommerfield J, Sanon M, Kouyaté BA, Sauerborn R. Perceptions of risk, vulnerability, and disease prevention in rural Burkina Faso: implications for community-based health care and insurance. Human Organization. 2002;139-146. Hill J, Hoyt J, Van eijk AM, et al. Factors affecting the delivery, access, and use of interventions to prevent malaria in pregnancy in sub-Saharan Africa: a systematic review and meta-analysis. PLoS Med. 2013;10(7):e1001488. Launiala A, Honkasalo ML. Malaria, danger, and risk perceptions among the Yao in rural Malawi. Med Anthropol Q. 2010;24(3):399-420. Analyzing global, national and sub-national data sources should give planners an understanding of what has happened to date, but there may be areas to learn more. If knowledge gaps have been identified (e.g., community and service provider knowledge and attitudes), it may be necessary to conduct further qualitative and/or quantitative research on the issues. Qualitative research might take the form of focus group discussions among pregnant women and those who influence their health behaviors and care-seeking decisions. Key informant interviews with gatekeepers and providers such as community drug vendors, traditional birth attendants, facility-based service providers and community workers can provide invaluable information about what people do, why they do it and the obstacles to address to affect positive behavior change. Findings should also inform how to best formulate messaging and choose appropriate channels. Quantitative research may include household surveys with the target audience, as well as other populations who might influence their healthcare-seeking behaviors. The BCC Indicator Guide, developed by the RBM Partnership, contains a list of standard behavioral indicators and appropriate prioritization of those indicators. These questions can be asked both at the beginning of a program during the formative research phase, as well as at the end of a program during the assessment phase. Situation: According to a 2013 malaria SBCC survey, less than one fifth of Liberians responded that they had discussed the issue of malaria in pregnancy (MIP) with spouses or friends in the last year. The majority of those surveyed felt that most women attend at least four ANC visits. Many women asked about IPTp expressed doubt that taking it would reduce their chances of getting malaria during their pregnancy. In this survey, the most important source of information about IPTp was service providers (mentioned more frequently as a source than radio). Liberia Technical Guidelines for MIP 2015 states that pregnant women do not attend as many ANC visits as they could, and often show up late in their pregnancy. Many do not arrive with their ANC card in hand. DHS data indicates that less than half of pregnant women received two or more doses of SP by 2013. This proportion has remained almost unchanged since 2011. SBCC emphasis: Taken as a whole, this survey data suggests that SBCC activities at the community level should aim to increase knowledge about MIP, promote positive attitudes regarding the efficacy of IPTp, and emphasize interpersonal communication within the family and with friends about IPTp. CHVs and TTMs should encourage early and regular ANC attendance, and remind pregnant women to demand both SP and LLINs. At the facility level, service providers (the most frequently cited source of information regarding IPTp) should be encouraged to counsel pregnant women on the importance, safety, and efficacy of IPTp. Beyond awareness, these interventions should seek to to address response-efficacy (confidence in the effectiveness) of IPTp among pregnant women, and to to increase self-efficacy (confidence in one’s ability) to attend ANC early and every month thereafter. Benefits of ANC should be emphasized. Family and friends of pregnant women should be encouraged to discuss the importance of ANC attendance with them. Service provider self-efficacy to provide counseling to pregnant women during each and every ANC consultation must also be raised. This website is made possible by the support of the American People through the United States Agency for International Development (USAID) under the Health Communication Capacity Collaborative (HC3) Cooperative Agreement #AID-OAAA-A-12-00058. On-going support is provided by Breakthrough ACTION with support from USAID’s Bureau for Global Health, under Cooperative Agreement #AID-OAA-A-17-00017. Breakthrough ACTION is based at the Johns Hopkins Center for Communication Programs (CCP). The contents of this website are the sole responsibility of Breakthrough ACTION and do not necessarily reflect the views of USAID, the United States Government, or the Johns Hopkins University. HC3 thanks Bill Brieger, Andrew Tompsett (PMI/USAID) and Tilly Gurman (HC3) for their technical oversight. HC3 also thanks members of the Roll Back Malaria (RBM) Malaria in Pregnancy (MiP) Working Group for providing valuable feedback.